The assorted musings of Alan Rhoda, Ph.D. (Philosophy, Fordham University, 2004) on matters philosophical, theological, political, or whatever else floats my boat. My primary research interests are metaphysics, epistemology, and philosophy of religion. I'm currently a Postdoctoral Research Fellow at the University of Notre Dame Center for Philosophy of Religion. In my spare time I like to read, and not just philosophy either, but literature, especially the so-called 'great works' and works in the sci-fi/fantasy genre. I recently completed Sir Thomas Malory's fifteenth-century classic, Le Morte d'Arthur. It's the primary source for the collection of tales that makes up the Arthurian legend - King Arthur and the knights of the Round Table, the quest for the Holy Grail, etc. One of my reasons for reading Malory was to acquire some background so that I could more profitably read T. H. White's 1939 retelling of the Arthurian legend in his fantasy classic, The Once and Future King. White's title comes from King Arthur's epitaph (as recorded by Malory): Hic iacet Arturus, rex quondam rexque futurus. [Merlyn speaking to Arthur:] Now ordinary people are born forwards in time, if you understand what I mean, and nearly everything in the world goes forward too. This makes it quite easy for the ordinary people to live. . . . But I unfortunately was born at the wrong end of time, and I have to live backwards from in front, while surrounded by a lot of people who live forwards from behind. Some people call it having second sight. . . . You see, one gets confused with Time, when it is like that. All one's tenses get muddled, for one thing. If you know what is going to happen to people, and not what has happened to them, it makes it difficult to prevent it happening, if you don't want it to have happened, if you see what I mean? Like drawing in a mirror. What I find interesting here is how Merlyn could even think that he could prevent what has happened if time is as he relates it here. He seems to be describing as merely difficult ("like drawing in a mirror") something that seems to be logically impossible, namely, making it to be the case that what has happened has not happened, that is, changing the past. Indeed, if Merlyn's right about the nature of time, then the future is just as settled as the past, the distinction between them being merely a matter of perspective depending on which direction one is "moving" in time. If that's right, then the future can no more be changed than the past. 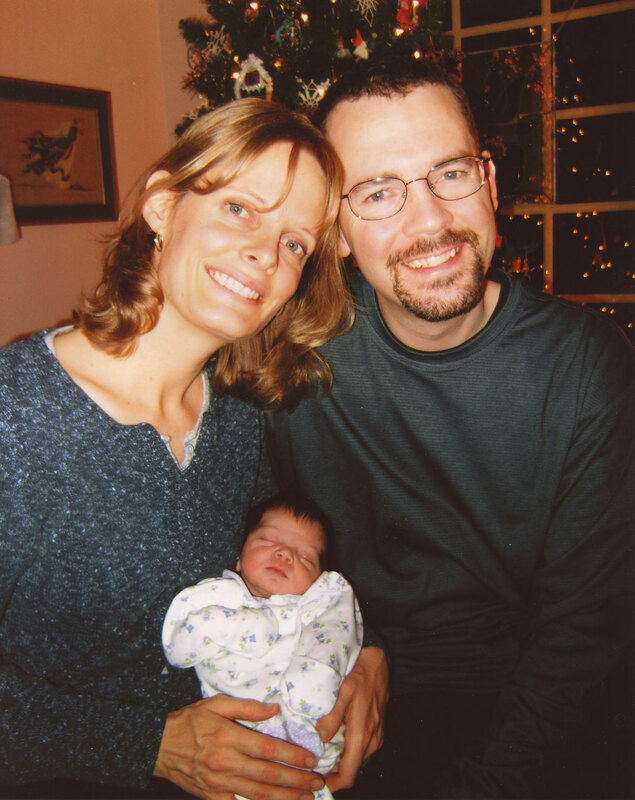 Here's a picture of my wife Heather, myself, and our new baby girl, Janelle Tiara. She was born 12/18. We picked her up from Catholic Charities on 12/22. Since then, we've both been very busy caring for Janelle, but we also feeling very blessed going into this new year.